Yesterday’s candle on the usd to cad daily chart, suggested that the recent attempt to rebase and squeeze higher may have come to an abrupt halt, as the forex trading session closed with a bearish shooting pattern. The upper wick of the candle was particularly deep, and in addition the high of the day failed to breach the 1.11 level once again, where this rally stalled earlier, adding to the view that we may see a move lower in the short term once again for the usd to cad pair. However, it should be noted that yesterday’s close did find a modicum of support from the 9 and 14 day moving averages, so any short position trading today should bear this factor in mind. 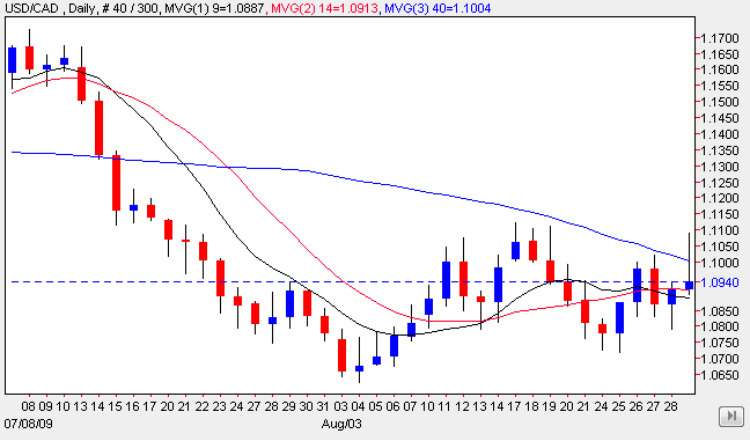 A break below both the moving averages will add further weight to the bearish picture now coming back into play once again with an initial target of 1.07 in mind once again. As we start a new forex trading month for the usd to cad, there is no fundamental news on the economic calendar for Canada today, with all the news coming from the US, which I have covered for you in more detail on the euro vs dollar site.You can keep up to date with all the latest fundamental news on the economic calendar, latest currency news and live currency charts by simply following the links. I have also included details on an excellent ECN broker.